This house is a fine example of the Mediterranean Revival Style that flourished during the 20th Century from the end of World War I and the 1930s. It is intact and has no alterations that detract from its original design. The Waite Residence features a low-side gabled tile roof, and a recessed arched front porch. 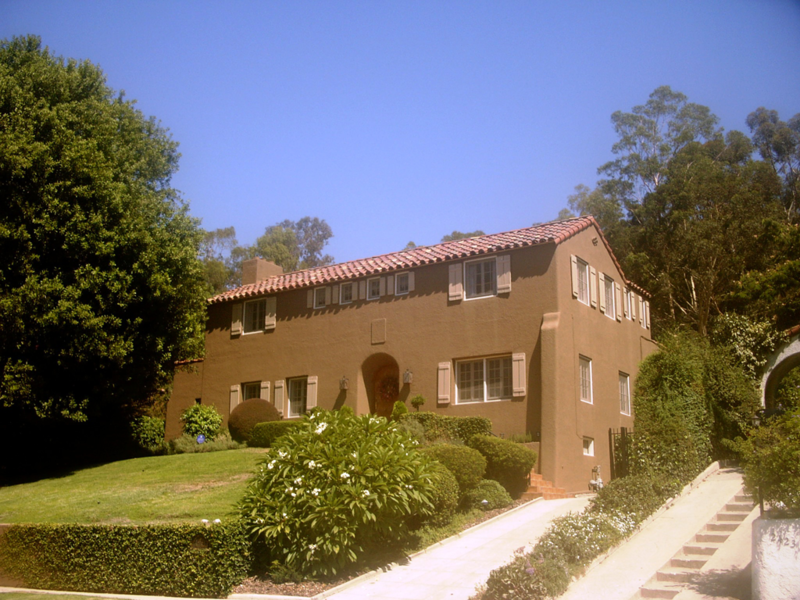 the home was built in 1922, when Eagle Rock was a separate city from Los Angeles, for Charles C. and Effie Waite. The home was designed by Los Angeles architect, Harwood Hewett and built by contractor W. W. Scates. The home is one of the earliest revivals to be built in the fashionable Hill Drive section of Northern Eagle Rock. Hewitt was an important architect and is discussed below. Charles C. Waite was a prosperous citrus farmer from Riverside County, who had retired and then worked for several years as a citrus broker in San Francisco. He and his wife, Effie, had the Hill Drive home built for their retirement. Harwood Hewett was the architect of a number of important buildings and residences in Southern California. He was also a founding member and secretary for the Allied Architects Association that designed many of the best known public buildings for the County of Los Angeles, such as Patriotic Hall, Los Angeles County USC Medical Center and the Hall of Justice (now undergoing restoration). Hewitt was a graduate of the University of Chicago, the Massachusetts Institute of Technology and the Ecole des Beaux Arts, in Paris, France. After a successful career in Denver, Colorado, Hewitt came to Los Angeles in July 1913 and went into partnership with Oliver P. Dennis, formerly of Dennis and Farwell. That partnership lasted about three years and produced a number of well designed Revival buildings in domestic, commercial and educational areas. The Waite Residence was designed in the beginning years of Hewitt’s final period (1920-1926), during which, except for a short Period, when he was teamed up with H. L. Barker in 1921, he was without a business partner. His work with Allied Architects Association is important because, as secretary, as he was heavily involved in contract negotiations for the various public buildings that were designed by that consortium of the best and brightest architects in Southern California. He was a part of the committee that chose the design for the present Los Angeles City Hall and was the original architect for the Los Angeles Ebell Club on Wilshire Boulevard, his sudden death in January 1926 occurred at the height of his career. He was truly one of the influential architects in Los Angeles at the time he designed the Waite Residence.